Adventure proof packing systems and gear company Giant Loop has introduced the GL Camping System, a collection of ultralight, compact, multi-functional, high performance, high value camping gear to help motorcycle travelers reduce the weight and bulk of their camping equipment. In keeping with the company's "go light, go fast, go far" approach to dual sport and adventure touring motorcycling, Giant Loop drew upon its staff members' passion for outdoor pursuits such as backpacking, rafting, mountaineering and backcountry skiing to assemble the GL Shelter System, GL Cooking System and other essentials. Shelter Tarp 100, a 10' x 10' tarp that packs into its own integrated stuff sack, measuring 10" x 5" and weighing 20 oz. Made in USA, the Shelter Tarp 100 can be quickly deployed to create an alternative to a tent or to supplement a tent with covered space that can be configured in a multitude of ways, such as standing height protection from pouring rain or scorching sun while repairing a flat tire. It can also be pitched over a picnic table or used to create a group camping shelter. MSRP is $106. Sleeping Sheath (aka bivy or sleeping bag cover) provides ultralight weather, dew and dirt protection to your sleeping bag, as well as boosting its warmth. Weighing just 9 oz. with a packed size of 8″ x 4″, the Sleeping Sheath features a zero seam tub floor, which means no seam sealing and no moisture entry from the floor. The top fabric is highly water repellent yet breathable, with an articulated hood that zips from hip-to-hip on either side, with a full no-see-um bug net hood. Draw cord stuff sack included. Made in USA. MSRP is $149. 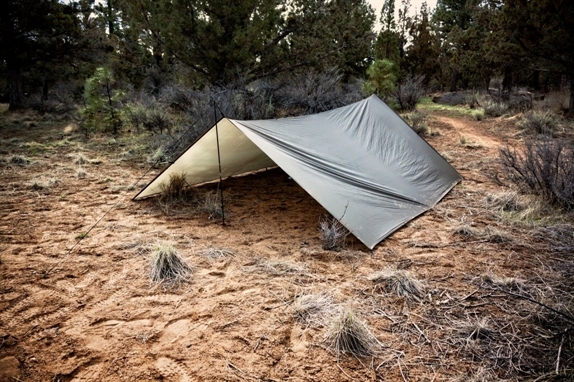 Tyvek® Ground Sheet is waterproof and extremely durable, creating a minimalist "floor" for our GL Shelter System, protecting the Giant Loop Sleeping Sheath from dirt, sticks and rocks. With proper care, one Tyvek ground cloth will last for a multi-month and multi-thousand mile adventure. Pre-wash your Tyvek in a washing machine to soften and reduce rustling sounds while sleeping. MSRP is $12. Aluminum Tarp Pole provides super strong aluminum support for the Shelter Tarp 100. The 45″ ultralight aluminum pole weighs just 3 oz. and folds into a 15″-long package. We recommend purchasing two poles to maximize shelter pitching options and configurations. MSRP is $14 each. Aluminum Stake Set includes eight stakes, six 6″ and two 8″ stakes, weighing in at a featherweight 2.5 oz. Use shorter 6″ stakes around the perimeter of the Giant Loop Shelter Tarp 100 and the two longer 8″ Easton aluminum stakes should be used on the two main guy lines, providing additional anchoring power to secure Shelter Tarp. MSRP is $15.99. Nite Ize Reflective Rope Pack comes in 50′ length, and is perfect for guy lines, hanging bear bags - and then being able to see where it is when you're done. Made of sturdy nylon with a special reflective strip woven into it that reflects brightly when light shines onto it, increasing night time safety. Also handy for zipper pulls and pull loops for the Aluminum Stake Set. MSRP is $11.99. Vargo Titanium Converter Stove weighs just 1.6 oz. and features a folding stand that allows for compact packing and use as a standalone camping stove. Or, convert the titanium Vargo Hexagon Wood Stove into a complete multi-fuel stove by combining it with the Vargo Converter Stove. Its easy "drop-in" design turns the Hexagon into an effective windscreen while providing the ideal distance between stove and cookware for optimal cooking efficiency. Unlike other stoves, the Converter Stove will cook faster and won't leave soot on the bottom of your pots. Burns alcohol, fuel tabs or fuel gels. Simply flip the stove over to switch between alcohol and fuel tab/gel burning modes. Alcohol fuel capacity is 2 oz., which provides burn time for approximately one meal. De-natured alcohol is inexpensive and easy to source at hardware stores or automotive stores (gas drying product). MSRP is $39.95. Vargo Titanium Hexagon Wood Stove uses easy-to-find, sticks and bits of wood - renewable fuel that can be found at campsites instead of carried on a motorcycle. Combined with the titanium Vargo Converter Stove, the Hexagon provides a windscreen and super stable cooking platform for a complete multi-fuel cooking system. This ultralight titanium camping stove weighs just 4.1 oz. and packs flat. MSRP is $59.95. 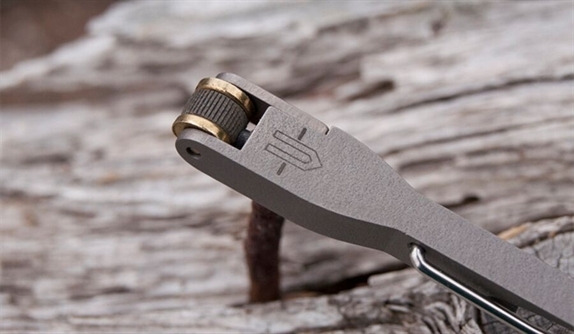 Vargo Titanium Flint Lighter makes an excellent companion for igniting the alcohol to start the Vargo Titanium Converter Stove, plus it delivers a dependable spark in the most adverse conditions - even after getting doused with water - making it the perfect choice for other fire lighting needs. Weighs 0.3 oz. MSRP is $19.95. Alcohol Fuel Bottle transports enough clean burning denatured alcohol to cook several meals. Flip top for quick, easy stove filling. Leak proof to prevent spills. Ounce gradations on bottle for accurate fueling of titanium Vargo Converter Stove for camping. Weighs 1 oz. MSRP is $2.50. Vargo Titanium Ti-Boiler Cooking Pot + Pan triples cooking capability and efficiency. The Ti-lite 900 ml titanium Mug pairs with a titanium 400 ml lid-pan to create a double boiler system that allows two items to be cooked at once to save time and fuel. The lid-pan is uniquely designed to nest on top of the mug to utilize the captured heat from the mug to cook food slowly preventing burning. Weighs just 6.6 oz. MSRP is $69.95. Vargo Titanium Knife, Fork & Spoon ULV features a small, narrow design to make them lighter and more compact than standard camp cutlery. The matte finish pure titanium is biocompatible and will never corrode. Each piece weighs less than 0.5 ounces (14 grams). Mini carabiner included. MSRP is $24.95. Vargo Titanium Funnel Flask features a patented integrated silicone funnel that is always right where you need it. Simply flip it up for easy filling, then fold it down to sip comfortably. The Vargo Titanium Funnel Flask holds 8 oz. of your favorite drink while imparting no taste, odor, or chemicals meaning you and your single malt stay pure. The funnel also functions as a perfect spout to pour your alcohol back into its original container. Weighs just 3.7 oz. MSRP is $74.95 (custom engraving is available for an additional $25). FeatherLiteTM First Aid Kit 2.0 contains an assortment of first aid supplies needed to treat a variety of minor injuries. The outer case is constructed of durable, lightweight nylon cloth that is bright red to make it easy to locate. A detailed First Aid Kit Owner's Guide is also included with basic first aid instructions. Measures 8.25″ x 4.75″ x 2″ and weighs 8 oz. MSRP is $17.99. FeatherLiteTM Survival Kit 1.0 contains an assortment of essential supplies for emergencies, including button compass, emergency blanket, emergency poncho , JetScreamTM Micro Whistle, 4″ See-MeTM Light Stick, StarFlash® Micro Mirror, survival towel and waterproof matches. Contents are stored inside a lightweight, compact orange pouch for convenient storage, measuring 7" x 6.5" x 1.5" and weighing 8 oz. MSRP is $15.99. Rounding out the GL Camping System are the collapsible ultralight Joey Chair (MSRP $79.99), the Orion Tilt Hat Clip LED light (MSRP $24.99)secures to helmet visor or hat, the Princeton Tec BYTE LED Headlamp (MSRP $22.99) offers ultra-compact lighting, Tenacious TapeTM Repair Patches (MSRP $2.95) to make durable field repairs on fabric and the Zipper Care zipper cleaner and lubricant (MSRP $4.95) keeps zippers sliding smoothly. The Giant Loop Camping System is available exclusively from Giant Loop's Bend showroom and online.